You must install the J2RE 1.4 (Java 2 Runtime Environment) for your system. So if Screamer wont run for you, make sure you download this file. It is only 10MB, see the second table, second row JRE column download. You don't need SDK. Just double click Screamer.bat. You can resize the window for better view. 1) Right click My Computer then open Properties. 2) Click Advanced then click Environment Variables. 3) In the System Variables box (the second one) click New. 5) Variable Value: c:\Screamer (The path where Screamer is installed, if you're not sure open the Screamer folder and check the title bar.) 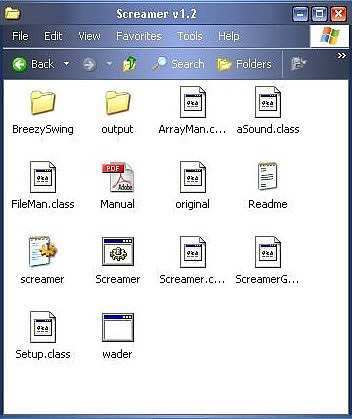 Delete the pause line from Screamer.bat and now run Screamer. When you save with WadMerger it will overwrite the sfx and sam files so you will have to recopy them. I've tested this on two system one running Windows XP the other with Windows 98. On the Win98 system the Output WAD feature doesn't work. I also know that it won't work on a Mac so I have included the Output Batch feature. This will make two files a Sounds.txt and a <wad name>.bat. Copy these into [trle\sound\LevelSFX Creator] folder and double click the batch file to create the <wad name>.sam and <wad name>.sfx files. Or place a copy of pcwadsfx.exe in the [output] folder. If you place a short cut to the [graphics\wads] folder in there too copying is quick and easy. 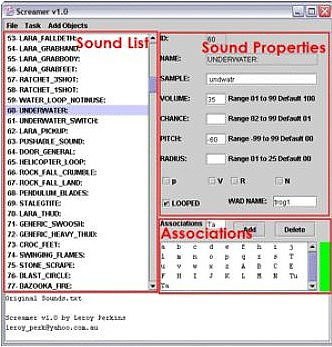 Baddies that make water sounds when they shoot is caused by having too many sounds in the tr4 file. To fix this remove unused or unnecessary sounds. Since the samples a level needs are included into the tr4 file these files become very large. They can be reduced by removing unused or unnecessary sounds. Object makes no sound. Add the sound, but which sound do I add? Use WADMerger's Animation Editor, open the Animation Commands dialog and flip through the animations. Make note of all the sound ID's used. Some sounds are attached to Lara and not the object. For example, the Floor Lever object has no sounds but the animation of Lara using the Lever has both sounds of Lara (steps and grunts) and the Lever (clicks, grinds and squeaks). The Wraiths sounds are to loud, just use Screamer to add the wraith sounds because WADMerger plays all included sounds at full volume. Object makes an unusual or completely wrong sound. Either change the sample used (with Screamer), change the sound played (with WADMerger) or delete the sound (with Screamer). Sound stutters when playing. Uncheck the Looped box for this sound. The tomb2pc converter is asking for a sound that isn't there. Either delete the sound that uses this sample or copy and rename an appropriate sound file. Problems have been experienced when using large wav files, there maybe a file size limit. Try breaking the sound into two files and then play them sequentially. If you have problems using a certain sound slot try another one and change the sound ID that is played for that object in Animation Editor. Loads a fixed up version of the revised wads Sounds.txt. Load previous changes you made. You choose location of save. Choose the settings that will be used when Screamer is started. Auto Load will load the selected file at start up and when you click save on the settings dialog. This will create <wad name>.sam and <wad name>.sfx files in the OUTPUT folder. This operation will use the information in Association and Wad Name fields. This will create a Sounds.txt and <wad name>.bat files in the OUTPUT folder. This operation will use the information in the Association and Wad Name fields. This will reset all the properties of the current sound to those of the standard sounds. This will remove all the associations for the current selected sound, expect those that are general 'g' or title 't'. This will remove all associations for all sounds expect those that are general 'g' and title 't'. This is for building sound files for objects when you want to share them with others. It will remove all association data for all sounds except those associated with the current value in the association field. This will associate all the sounds for that object using the value in the Association field. If you want more objects added to this menu contact me. You must click on the sound to bring up its properties. This cannot be changed, it corresponds with the id's used by WadMerger and Flipeffect 10 trigger. Enter the name of the sample that you want to play as this sound. The name should not have any spaces in it and drop the .wav extension. So if you have a sample called TR3 Sound 316-1.wav change the name to TR3_Sound_316-1.wav, but only enter TR3_Sound_316-1 in the Sample field. Make sure the wav file is in the correct format: PCM 22.050 kHz, 16 Bit, Mono. In the following number fields to get the default value delete ALL characters in the field, that includes spaces. To avoid errors stay within the ranges and don't use any extraneous characters. Small numbers is quiet, big numbers is loud. This is the percentage chance the sound will play. Thus no entry will play 100% of the time whereas 1 will only play 1% of the time it is called. -99 is very low pitch. Think bass drum. 99 is very high pitch. Think violin. This is the distance in TR tiles the sound can be heard at full volume. After this it falls away, so you can still here 0 radius sounds if you are not on top of the object making the sound. If you know what these do then please inform me. If checked sound will play continuously, mainly used for things like water, fountain, earthquake and electricity; you get the idea. When you Output WAD or BATCH this is the name used. Enter a one or two character value, this is case sensitive so 'A' is different from 'a'. This information is used by the ADD and DELETE buttons and also by the Output WAD and BATCH features. 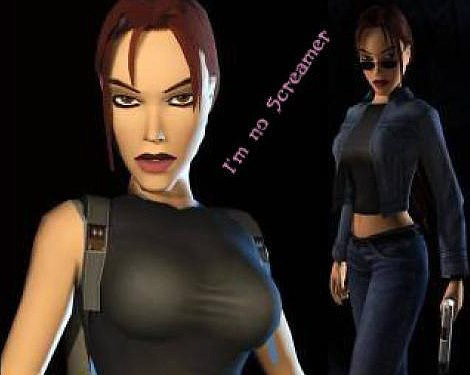 The character 'g' is general, these sounds get included in all WADs, they're mainly the sounds Lara makes, foot steps and grunts and stuff like that. 't' is for title. Will associate this sound with the current value in the association field. Will disassociate this sound from the current value in the association field. Green is for associated, red for not associated. So it will be green for all 'g' and sounds associated with the value in the field. This lists all current associations to the selected sound. Contains conformations of activities and other messages. Don't place this tool for download on any site without my permission. I won't say no, I would just like to know where it goes. Copyright 2003. This program is the intellectual property of D. Michael McQuillan. It is free for distribution only with the permission of Leroy Perkins/D. Michael McQuillan. This software is not to be sold, leased or modified. This software was not made and is not supported by Core Design Ltd. and Eidos Interactive. This manual must be included with the software when distributed.